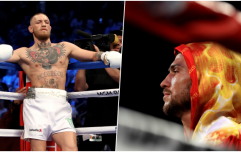 Weight was an issue at Thursday's weigh-ins for Vasyl Lomachenko vs. Anthony Crolla but it had nothing to do with the fighters hitting the 135lbs limit, which both did without bother. Instead, it was the weight of Lomachenko's gloves that caused something of a stir as Crolla's camp demanded that the gloves that will be worn by the defending WBA (Super), WBO and The Ring lightweight champion be weighed before fight night. Crolla's trainer Joe Gallagher was of the opinion that Lomachenko's gloves were too light and when he was told that there were no scales that could give an accurate measurement of the gloves' weight, Gallagher found some scales of his own. A heated argument followed between the fighters' teams and while we've seen glove debates amount to no more than an attempt from one fighter to disrupt an opponent's focus, Gallagher seemed adamant to have everything above board with regards to Lomachenko's gloves. "Joe Gallagher felt that Lomachenko's gloves were very light, so he wants them weighed," promoter Eddie Hearn explained to Sky Sports. "They didn't have a set of scales here to weigh the gloves, Joe Gallagher brought his own set of scales, which they didn't want to particularly use. "They said they will weigh them later and Joe wants to see them being weighed. He's well within his rights, in my opinion to see that. They are a new brand of glove, so they are not something that we're particularly used to. "Sometimes it's just a little bit of mind games from camps just to make sure people are a little bit unsettled. Joe's very good at that, but I think he has a point on this occasion and the commission here are outstanding, so we don't see any problems."